Every football player has different preferences when it comes to accessories needed to succeed. 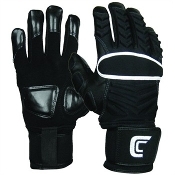 Football gloves are no different than any other accessory. Some players prefer to wear wide receiver gloves regardless of what position they play. 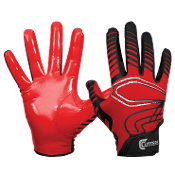 You will often see a lineman or quarterback wearing football receiver gloves to give them some extra grip or a competetive advantage. 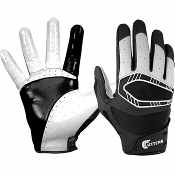 Conversely it is also common to see linebackers or running backs wearing both receiver gloves and lineman gloves. 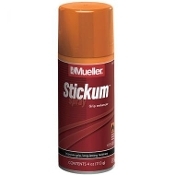 If a running back or linebacker has a hand or finger injury they throw on some lineman gloves with some stickum for extra grip and head to battle. 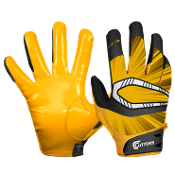 No matter what your need for football gloves is, Endzone Sports has all of the styles you need. 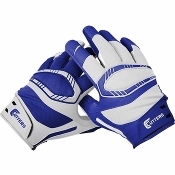 Endzone is proud to supply you with youth football gloves and adult football gloves from Cutters, the industry standard in gloves and C-Tack technology. Improve your performance and confidence knowing that you are wearing the best football gloves made from the best football glove company! Shop with confidence from our selection knowing that Endzone offers you the best football gloves for the best prices available!